Great Raclette Grill for the perfect party or as a great gift! 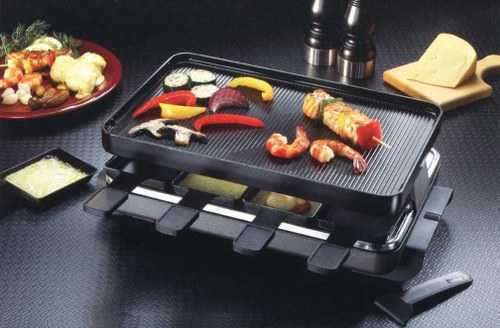 8 pan Rectangular Raclette Grill features a reversible grill/crepe top; 120 volt, 1100 watt variable heat control. Includes 8 Raclette pans and 8 spatulas. Optional granite stone top for $60.00. Rectangular 10"" x 17"" grill. Color: Anthracite. To purchase your raclette cheese, be sure to go to www.alpanddellcheese.com to check out their selection of fine cheeses. Service Area: New Glarus, Beloit, Madison, Rockford, Sun Prairie, Loves Park, Whitewater, Roscoe, Platteville, Waunakee, De Forest and surrounding communities.